The National Weather Service on Sunday released a dire warning about flooding in Houston, Texas. “This event is unprecedented & all impacts are unknown & beyond anything experienced. Follow orders from officials to ensure safety. #Harvey,” the NWS tweeted Sunday. Tropical Storm Harvey has caused chest-deep flooding on some streets in Houston as rivers and channels overflow their banks. 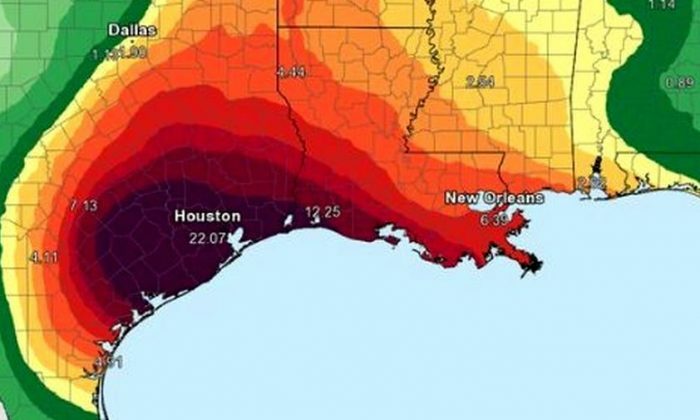 After up to 30 inches (76 cm) of rain in some parts of the fourth most-populous U.S. city, the storm is expected to dump 12 to 25 more inches (30-63 cm) over the next few days, the National Weather Service forecast. The total could reach 50 (127 cm) inches in some coastal areas of Texas by the end of the week, or the average rainfall for an entire year. The center of Harvey is still 125 miles away from Houston, and forecast to arc slowly toward the city through Wednesday. As the New York Times reported, at least five people have died in the disaster. “Everything that we had hoped wouldn’t happen but was forecasted is happening. We have a catastrophic, life-threatening flood event taking place over southeastern Texas, including the Houston metropolitan area. It’s bad now and it’s getting worse,” the National Hurricane Center stated Sunday. Houston city officials called on flooded residents to go to their roofs—not their attics. President Donald Trump said in a Twitter statement that he’s planning to head to Texas. “Wow – Now experts are calling #Harvey a once in 500 year flood! We have an all out effort going, and going well!” he tweeted.